Menon said Malaysians have always been concerned about corruption, as indicated by the survey, which was further affirmed by ongoing news coverage and revelations after the country's 14th general election on May 9, 2018. KUALA LUMPUR (Aug 14): Financial and political corruption is the top concern among Malaysians, according to a survey by market research and consulting firm Ipsos Sdn Bhd. According to the Ipsos survey, which involved 3,500 respondents between January and July, 2018, 60% of respondents said they were worried about financial and political corruption, followed by unemployment and jobs (43%). The survey showed that 41% of respondents were concerned about crime and violence, followed by moral decline at 31%. 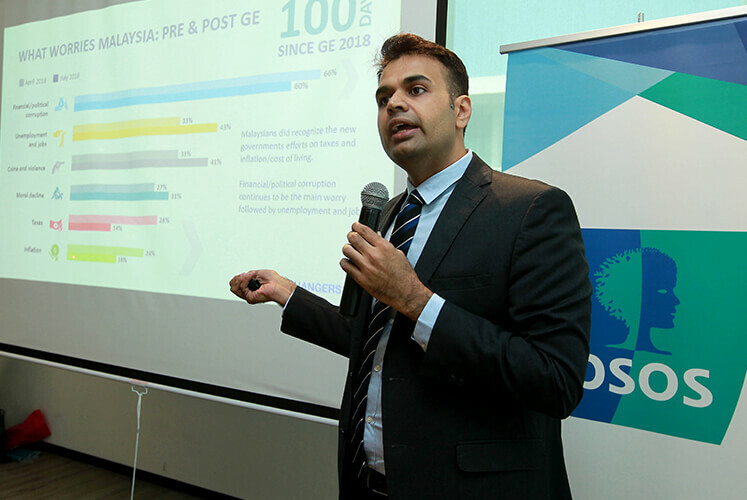 Ipsos managing director Arun Menon said Malaysians have always been concerned about corruption, as indicated by the Ipsos survey, which was further affirmed by ongoing news coverage and revelations after the country's 14th general election on May 9, 2018. Today, Menon said: "For the new Pakatan Harapan government, this offers a challenge as they face all-time high expectations from the public. Furthermore, there is a need for better accountability and scrutiny of their actions." Menon said this at a press conference here today in conjunction with the announcement of the survey findings.